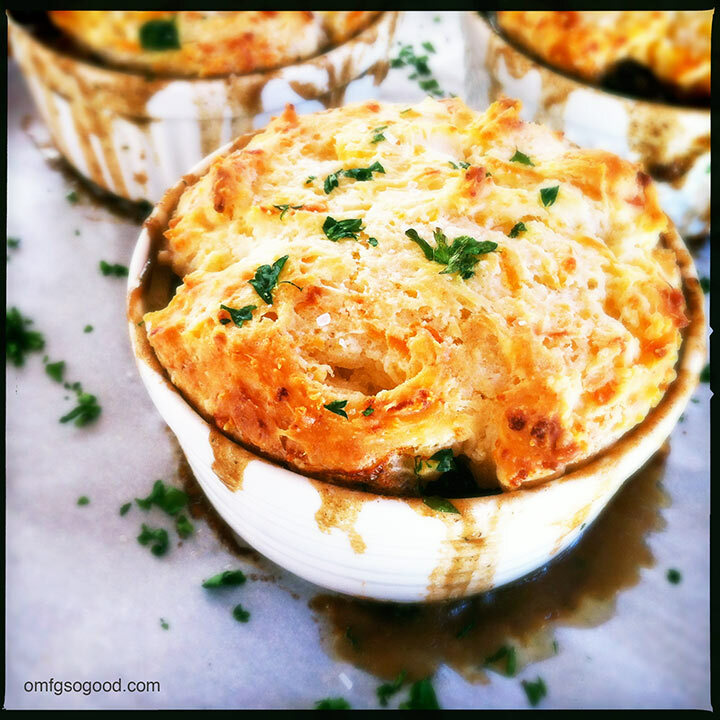 gruyere biscuit topped beef pot pies | omfg. so good. When I say “COMFORT”, you say “FOOD”! I’m a huge fan of pie for dinner. Or cobbler. 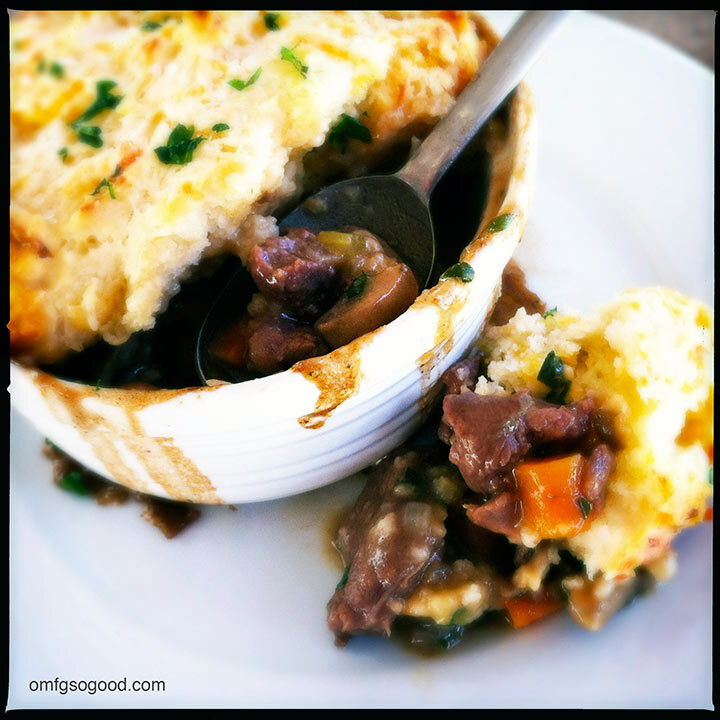 Steak cobbler, to be precise. And this little beauty does not disappoint. When I was a kid we ate a lot of beef. Growing up smack-dab in the middle of farm country, it was just the standard. I quickly learned how to mix things up by making a variety of soups, stews and savory pies rather than just slapping a steak on the grill and calling it a day. And in the process, I literally perfected the beef pot pie, which was (and will always be) one of my very favorite meals. 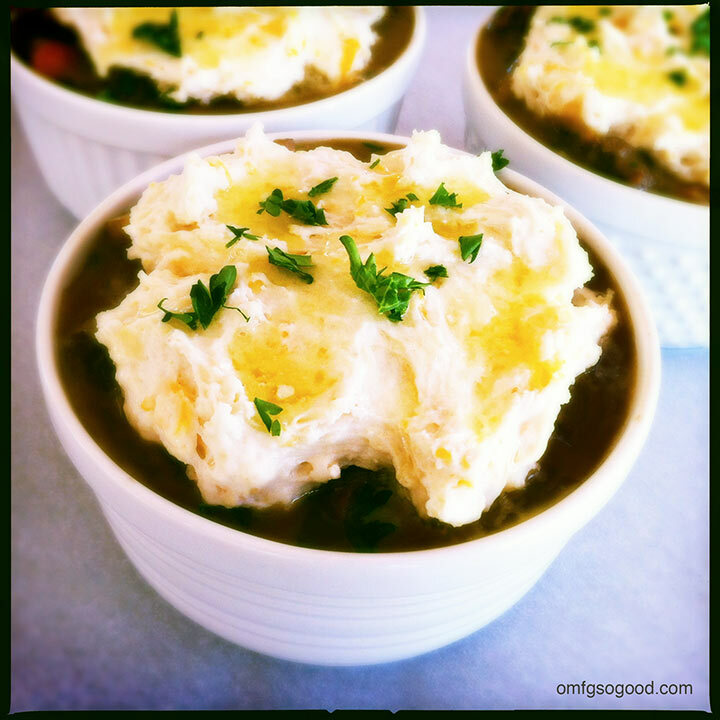 This version features a rich beef and veggie blend topped with a crispy, yet fluffy and cheesy, biscuit topping. All baked up in single-serving ramekins, ensuring each and every bite has the perfect ratio of topping to filling. Yup. Comfort *comfort*. Food *food*. Preheat the oven to 400 degrees. Line a sheet pan with parchment paper and set aside. To make the pie filling, heat the olive oil in a large pot or dutch oven over medium-high heat. Add the cubed sirloin, season with a sprinkle of salt, and cook until just browned. 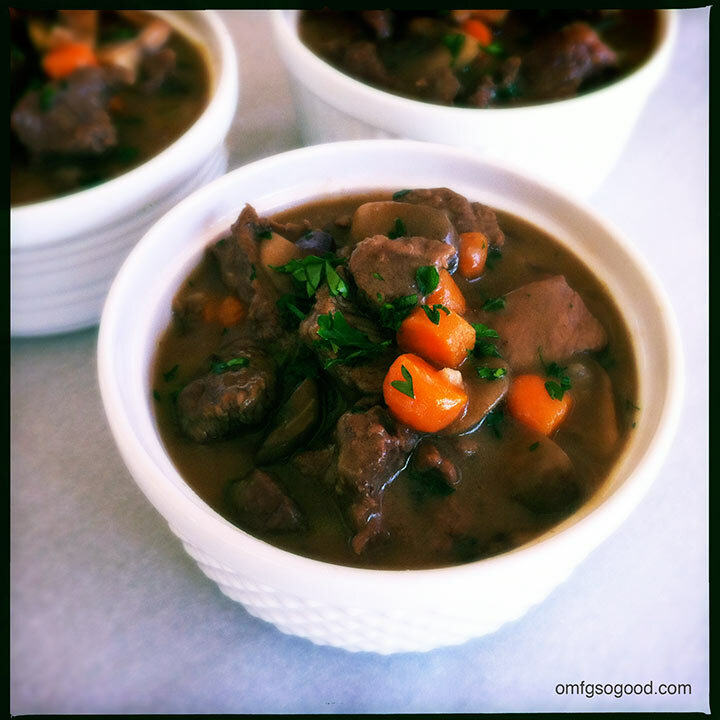 Use a slotted spoon to transfer the beef to a plate, then add the onion, celery and carrots to the same pot. Cook until the veggies soften and the onions and celery become a bit translucent. Add the sliced mushrooms, minced garlic, parsley and paprika, and cook for another 2 – 3 minutes to soften the mushrooms a bit. Add the sirloin back in the mix, then the flour and stir to coat the veggies and meat evenly. Slowly add in the beef broth and cream, then stir to combine. The flour coating on the meat and veg. will thicken the broth nicely at this point. Last but not least, toss in the frozen peas and stir to combine. Arrange four individual 8 oz ramekins on the prepared sheet pan. Spoon even amounts of filling into each ramekin and set aside while you make the biscuit topping. To make the topping, whisk together the flour, baking powder, salt and sugar in a medium mixing bowl. Make a well in the center of the dry ingredients and pour in the milk and 2 tbsp melted butter. Mix together with your hands to form a sticky dough. Add in the gruyere cheese and gently mix to combine. Spoon even amounts of dough on top of each of the four ramekins, drizzle with the remaining 2 tbsp melted butter and sprinkle with fresh parsley and a small amount of coarse sea salt. Bake (on the sheet pan) in the preheated oven for 18 – 20 minutes, or until the biscuit topping is golden brown and cooked through. Nothing worse than a doughy biscuit, folks. I show very little restraint when it comes to cobbler for dinner.